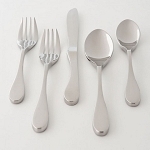 Eating Utensils - silverware, flatware, cutlery and other tableware that help make feeding and eating easier. Picking up silverware, a fork or spoon, and lifting food to your mouth, or picking up a knife to cut your meat then using the fork to lift the meat to your mouth. It's just natural for healthy people to eat and not think of every motion required to eat. Disabilities can interfere with daily living activities like eating. Physical limitations can make eating at dinnertime more difficult. Using special silverware can help. Larger silverware handles are easier to hold for people with diminished grip strength from a disability. 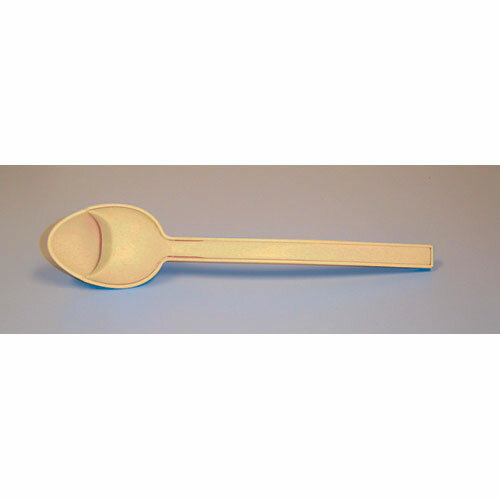 Added weight flatware can help stabilize tremors and shaking for people who have suffered a stroke or have Parkinson's. Ask your health care provider which ones will work best for you. 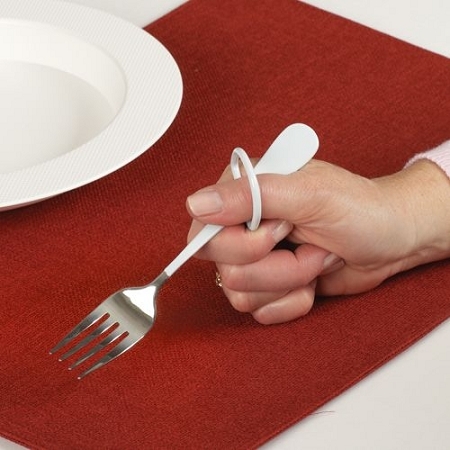 Loop handle helps to properly position utensil in users hand. 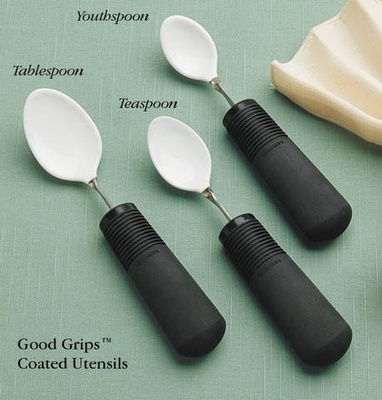 Vinyl coated easy grip utensil. Mouth guard prevents utensil from entering mouth to deeply. 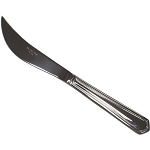 Lightweight and easy to grip curved utensils. Unlike a knife, the knork cuts through food with a rocking motion which is facilitated by a finger platform on both sides of the handle. 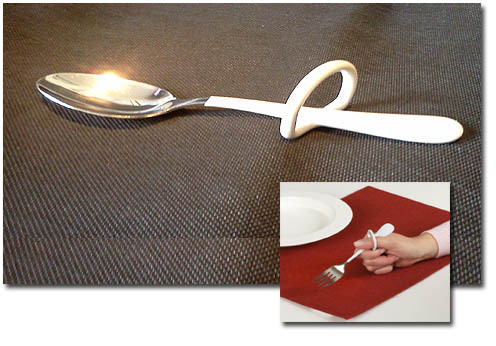 For those unable to use a knife and fork simultaneously because of Parkinson's, muscle weakness, or arthritis. Allows for a rocking motion, making cutting meats and vegetables much easier. Helps keep food on the utensil and limits spillage. Eating spoons provide several grasping positions. Eating fork provides several grasping positions.